Imagine owning Oscar de la Renta jackets, Chloe capes, and Chanel cap-toe booties, knowing that in about a year you&apos;ll just grow out of them? 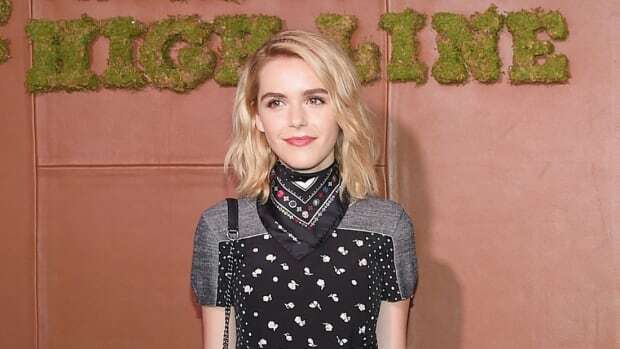 Such is the case for Kiernan Shipka, the latest fashion-loving celebrity to pop up on a hilarious yet endearing webisode of The Look. Harper&apos;s Bazaar Laura Brown caught up with the 12-(and a half! )-year-old Mad Men star at her home in Los Angeles to talk about Kiernan&apos;s taste in red carpet style, the difference between Sally Draper and actual drapery, and take a tour of her "legendary" closet. We really don&apos;t want to give too much away--the 6:41-minute-long clip is a must-watch for anyone who&apos;s ever liked high fashion, dry humor, adorable children with perfectly groomed eyebrows, Jimmy Fallon, vintage go-go boots, laughing in general, and/or karate. Which we think pretty much covers everyone. Enter this monochrome sheath from Coach.